If you have a family member who has been diagnosed with Alzheimer’s or another dementia-related condition, you seek the most trusted memory care West Des Moines offers. 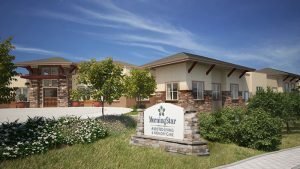 MorningStar at Jordan Creek provides memory care for those in the early onset of the disease through to its advanced stages. Our Reflections Neighborhood has 29 secure suites devoted to providing residents with an atmosphere of safety and well-being that supports the senior’s right to choice and remain independent to the fullest extent possible. As dementia care experts, it is our calling as well as our privilege to provide the Des Moines area with exceptional memory care. Using a philosophy and approach we call Lavender Sky which leverages the power of music, dance, art, aromatherapy, and animals, we find unique ways to connect with and nurture the essence of each individual. Our personalized care starts by interviewing family members to learn the resident’s history, talents, and preferences. While our Reflections Neighborhood provides a safe and secure environment, residents are free to move about in spacious surroundings that include an enclosed courtyard. Every day MorningStar at Jordan Creek memory care residents participate in a variety of purposeful and recreational activities including taking part in special events and scheduled outings. Our team is composed of well-trained care managers who work together to establish a daily routine designed to stimulate or calm the resident in response to their mood or situational encounters. We understand that a diagnosis of Alzheimer’s or another dementia-related disease is traumatizing for the entire family. MorningStar is here to provide the support and help you need. MorningStar at Jordan Creek exemplifies the finest in senior living with a unique mission statement of “to honor, to serve, to invest.” With a foundation built on honoring God, valuing all seniors and selecting staff with a felt calling to serve, we create a true home for residents within a beautiful setting. Please contact us to learn more about the most trusted memory care West Des Moines offers.